Attractions. An interesting and aesthetic tour following ridge systems in a big circle around the Tronsen Meadows/Tronsen Road area. The tour covers a fair bit of distance and is more about travel than turning. 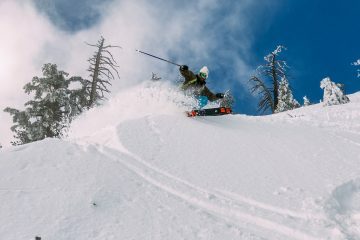 It’s an interesting tour for practicing navigational skills, offers great views of the Blewett Pass environs, and does provides access to some nice turns along the way. Distance: The complete loop is roughly 9.5 miles long. Elevation Gain: 3,775 (start) to a high point at Tronsen Head (5,980 (high point) with added bumps — 3,000 vertical total. Activities. 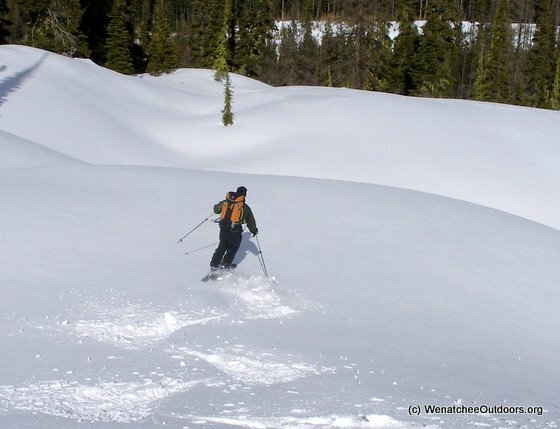 Backcountry skiing or snowshoeing. Access. From the Highway 2 / 97 junction (Big -Y junction), drive Highway 97 south 19 miles. About 1.2 miles from Blewett Pass, look for a small, unmarked pullout (large enough for a few cars) on the east side of Highway 97 (milepost 165.2). This is Road 7230 and the Tronsen Meadows Road (Rd 7240) is 0.4 miles south (uphill) of this access point. Note: Most winters the little pullout at road 7230 is plowed, but not every winter—sometimes you may need to park at the Tronsen Meadows Road pullout and walk, snowshoe, or ski along the edge of the highway to the start. We’ve described the loop in a clockwise direction because it makes the most of the downhill skiing. After doing the route as described, try it the opposite direction to mix things up. It will be a completely different route going counterclockwise. Follow the road (Rd 7230) away from the parking area in a northerly direction. 0.3 miles from the car, the road makes a big switchback. Leave the road here and climb the lightly forested ridge along a bearing of 122 degrees true north. At 4,800 feet you’ll reach the man-made structure we named this ridge for. This telemetry station had a wire jangling in the wind the first time we passed through here. From this structure, follow the ridge along a true bearing of 133 degrees to point 5,345, then a true bearing of 70 degrees to point 5,575, and finally a true bearing of 145 degrees to a peaklet at an elevation for 5910. Note: You needn’t always follow the ridge crest but this does provide the most dramatic touring. Now travel fairly flat but generally descending terrain in a southerly direction for 1.4 miles toward Haney Meadows until you hit Road 9712 connecting the Beehive Reservoir with Blewett Pass. Climb about 0.8 miles in a WSW direction up the next peaklet, known as Tronsen Head (5,980 feet). 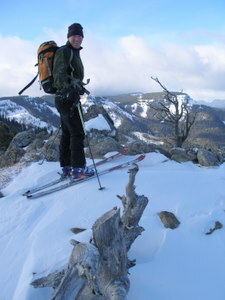 Roughly 0.25 miles before the summit of Tronsen Head (at an elevation of 5,800 feet) there are a variety of places skiers can more safely access the north-facing slopes dropping down toward Tronsen Creek and Tronsen Meadows (the accesses near the actual summit are steep, rocky, and far more avalanche prone). Find a line to your liking and descend 1,000 vertical feet in a northerly direction until you hit an old logging road at about 4,800 feet. Turn left on the road and head in northwesterly direction for about 0.9 mile, then at the intersection with the Lillaby Trail (not signed), turn right and head in northerly direction (downhill) toward the start of Tronsen Meadows Road. There is quite a network or roads, trails, and options leading back to where the Tronsen Meadows Road intersects Highway 97 and it’s difficult to explain all the possibilities. 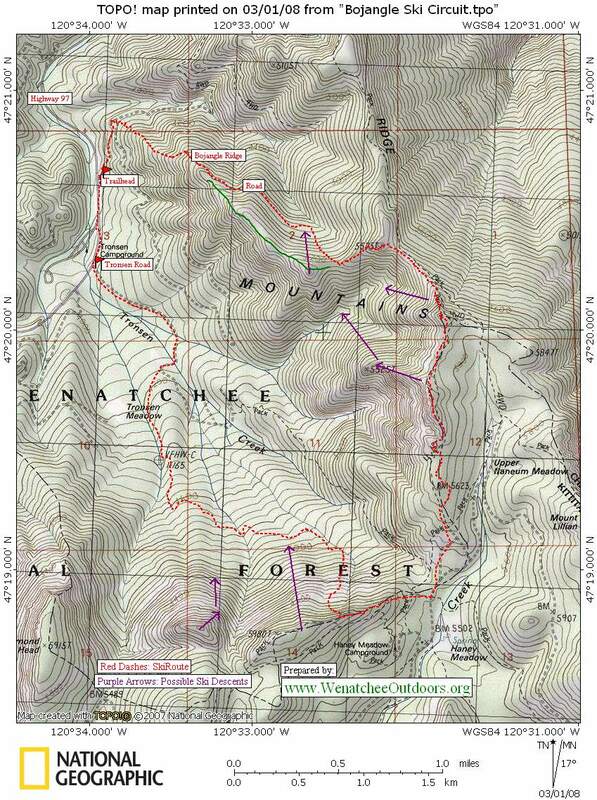 Use the Blewett Pass Winter Recreation map (see below) to help with the navigation back. Once back at Highway 97, ski along the road (or walk) 0.4 miles down the highway to the car. 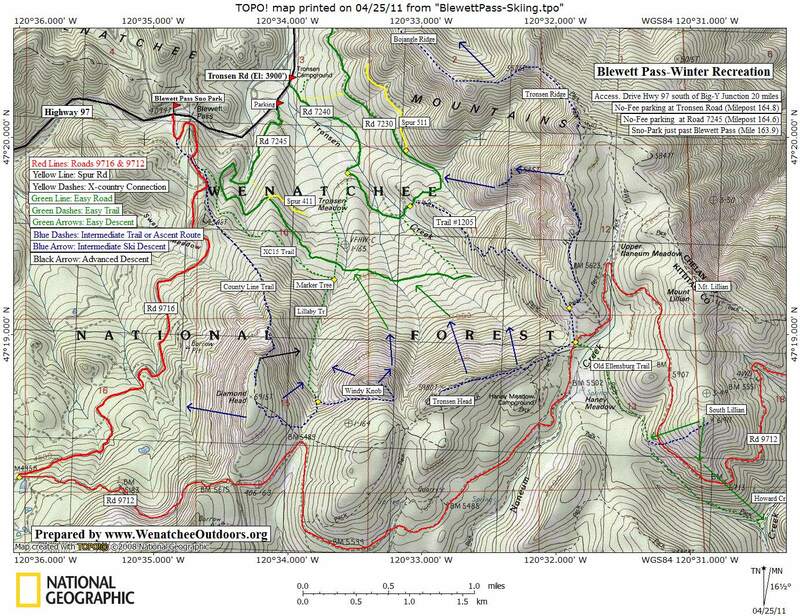 Map: See our topo map (map 1) featuring the loop. Use our Blewett Pass Winter Recreation map (map 2) to help decipher the many roads and trails in the area. Allowed: Cross-country skis, backcountry skis, and snowshoes are all allowed. 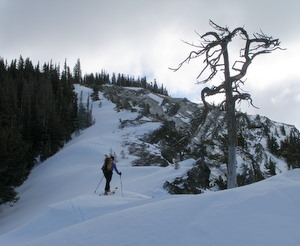 This route is appropriate for backcountry skiers on light metal-edged skis, heavy telemark skis, alpine-touring (randonnee) skis. It’s also a fine snowshoeing route. Not Allowed: Snowmobiles are not allowed on the parts of this route within the Tronsen Non-Motorized Area but are allowed on parts of the high ridges. 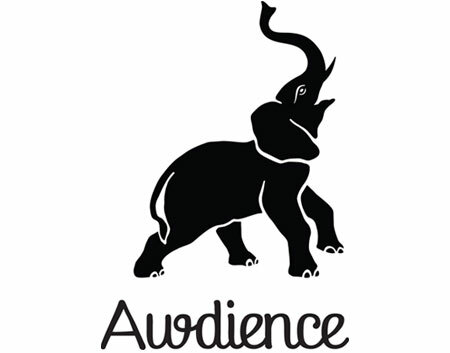 You’re likely to intersect their tracks along the way. Hazards: Avalanches are a possible hazard along parts of this route. 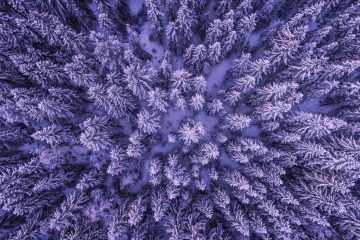 The ridge system followed as described above is relatively safe in most snow conditions. Slopes you may be tempted to descend off the ridge, are more prone to avalanching and require a higher level of expertise to evaluate. Leave It Better Than You found It: This should be every outdoor user’s goal. Pick up trash left by others and take other measures to leave the route more pristine than you found it. Important Disclaimer: Treat this information as recommendations, not gospel. Things change, conditions change, and those contributing these reports are volunteers–they may make mistakes, fail to give complete information, or may not know all the issues affecting a route. If things go wrong, you are completely responsible for yourself, your actions, and your safety. If you can’t live with that, you are prohibited from using our information.